To facilitate investments into the region, Russia has developed several programs, including the establishment of special economic zones with reduced tax regimes, a special gaming zone in the city of Artem in Primorskiy Krai to attract hospitality and tourism investors, and a free port zone in Vladivostok. However, the applicable rules are scattered among a number of different laws and regulations, and are somewhat difficult to navigate. Below we provide a brief overview of the Russian legal framework for investment incentives in the Russian Far East. gaming zone “Primorye” (created by the Government Decision No. 1213-p dated 20 August 2009 “On Establishment of Gambling Zone “Primorye”). Each of the above territories has its own unique legal framework and exists independently from the others. Notably, the regulations for each territory include special incentives for foreign investments. Currently there is only one operating SEZ in the Far East: the industrial and manufacturing SEZ “Vladis”. Previously, two more SEZs existed, namely “Russkiy Island” and “Soviet Harbour”, but they were terminated by the Russian Government in 2016, apparently with the goal of switching to the PDA model. Vladis was created on the basis of existing joint enterprises in the region – LLC “Mazda Sollers Manufacturing Rus”, an automobile manufacturing joint venture of Mazda Motor Corporation and PJSC “Sollers”, and LLC “Mazda Pacific Logistic”. SEZ Vladis offers several types of benefits to its residents, including (i) tax benefits; (ii) a free customs zone regime; and (iii) liberalized administrative regulations. A summary of the tax benefits is outlined in Table 1. While SEZs were introduced a decade ago, PDAs or priority development areas are a more recent innovation in Russia’s legal system, focused primarily on the Russian Far East. KGK Diamonds Private ltd., a major Indian diamonds producer has become a resident of the free port Vladivostok with a gem-cutting factory project. PDAs offer their residents a preferential tax regime, as summarized in Table 2 above. PDA residents also benefit from a free customs zone regime with duty and tax free import, storage and consumption of import goods. The Vladivostok Free Port includes the key sea ports of the Southern Far East and the Knevichi airport in Vladivostok. reduced visa requirements; foreign citizens arriving through checkpoints in the free port may stay up to 8 days without a visa. PDA and Vladivostok Free Port residents enjoy tax and payroll tax benefits as described in Table 2. Under a Russian law adopted in 2006, gambling is only allowed in a limited number of designated regions. One such zone, “Primorye”, is located in the city of Artem in Primorskiy Krai, 50 kilometers from Vladivostok. Foreign investors are already active in the gaming zone. A subsidiary of Hong Kong-based Melco Group has built and operates one of the biggest casinos in Russia, Tigre de Cristal. The gaming zone also benefits from the same simplified visa regime as the nearby free port, supporting the flow of visitors. In addition to creating special territories, the Russian government has established a special investment fund to facilitate new projects in the Russian Far East. The Far East Development Fund provides government co-financing to foreign and domestic investment projects. Created as a wholly owned subsidiary of the Russian state corporation “Vnesheconombank”, the Fund provides long-term financing on preferential terms for investment projects in designated industries and sectors, including infrastructure, upstream and downstream production of minerals, small and medium enterprises and agriculture, in the Russian Far East and Baikal regions. The procedure to obtain approval for Fund financing includes coordination with several different government agencies, notably the Ministry for Far East Development and the Governmental Commission for Questions of Social-Economic Development of the Far East and Baikal Region. formation of the Japanese-Russian Investment Platform. the Agency for Development of Human Capital in the Far East. Notably, the Far East Development Corporation oversees PDAs in the Far Eastern Federal District. The Agency for Development of Human Capital in the Far East provides support to investors looking out to hire employees in the region, including assistance with relocation. The Far East Agency for Attracting Investments and Export Support acts as a general promoter of investments. While Russia’s programs to promote investment in the Russian Far East are in early stages of development, the Russian government appears to be making this a strategic priority, in line with geopolitical developments. Accordingly, more projects can be expected in the future. Brian L. Zimbler is a Partner at Morgan Lewis and advises clients in a wide range of industries on M&A, joint ventures, and corporate and financial matters. He has more than 25 years’ experience with international transactions, having practiced in London and Moscow. Roman Dashko is a Partner at Morgan Lewis and advises international and domestic clients in M&A in the oil and gas, power, oilfield services, automotive, retail, pharmaceuticals, technology, and real estate sectors. He works on antitrust, pharmaceutical, and other regulatory matters as well. Dmitry Dmitriev is an Associate at Morgan Lewis whose practice involves structuring employment relations with top management and advising on employment disputes. 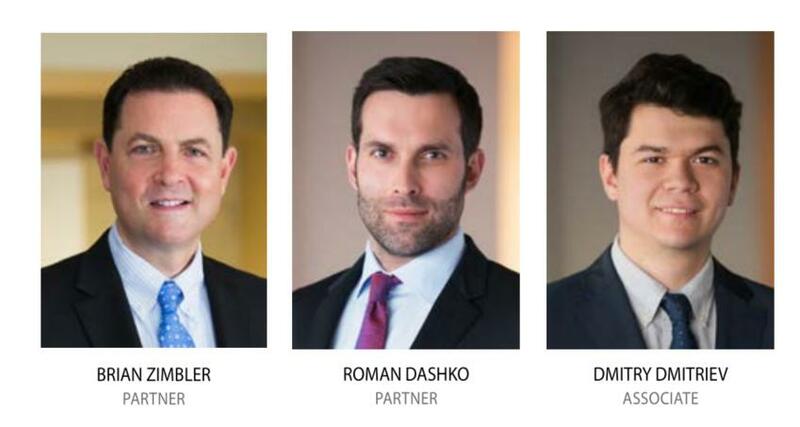 Additionally, Dmitry advises companies and individuals on matters that involve Russian corporate law and real estate transactions.